Sorry, Syndrome's not coming back. HONEY!!! IT'S BEEN 14 YEARS AND I STILL CAN'T FIND MY SUPERSUIT! I NEED IT TO GO WATCH 'THE INCREDIBLES 2' THIS SUMMER! Ever since the most sequel-able Pixar film, The Incredibles, came out fourteen years ago, we've been subjected to an entire trilogy about sentient talking cars, and yet we've still had no The Incredibles 2. But they have begun making one, and I don't think I've been more excited for a Pixar movie in a while. From watching the teaser, I can tell this is gonna be the bomb. And a few days ago, OUT OF NOWHERE, Pixar released the cast of The Incredibles 2, revealing that not only would the original cast members be back, but there would be several new characters. 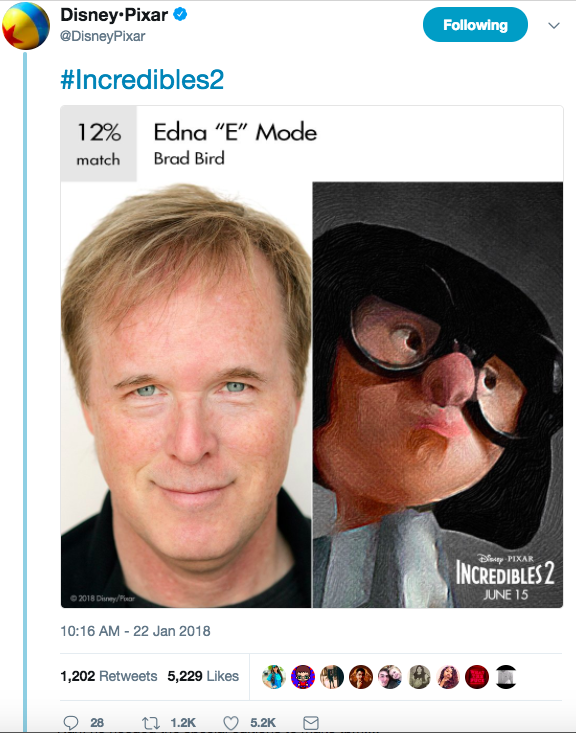 So, first off, Craig T. Nelson, Holly Hunter, Sarah Vowell, Samuel L. Jackson, and Brad Bird are all returning to their roles as Mr. Incredible/ Bob Parr, Elastigirl/Helen Parr, Violet Parr, Frozone, and Edna Mode, respectively. And the voice actors of Dash Parr and Rick Dicker will be replaced by Huck Milner and Jonathan Banks. But Pixar also released a few new characters that weren't in the original, and I'm gonna give you my thoughts on the possibilities of each character being the VILLAIN of The Incredibles 2. Winston leads a world-class telecommunications company alongside his genius sister, Evelyn. He is a huge supporter of Supers and wants them to return to the spotlight. This is the character description according to Oh My Disney, and given that he is a huge supporter of supers, I'm not sure how he would be the villain. But with Toy Story 3 and Up, we know that Pixar knows how to have a secret villain. I do still have doubts about Winston as the MAIN villain. She is the brainchild behind Winston’s company, knows her way around tech, and has never met a problem she couldn’t solve. I definitely think that she could be at least one of the antagonists. She knows her way around tech, so she could be making weapons for the villain of the film. And if you look at her name, "Evelyn Deavor," it appears to be a play on the words, "evil endeavor." So, this was likely an intentional move from Pixar. She is an advocate for the Supers and committed to the support and legislation of Superheroes. We don't know much about this character, but she's being portrayed by Isabella Rossellini, an Italian actress, so, she should be an Italian ambassador. I don't know about her being a villain, but with that combo of eyebrow shape and hair, she looks kind of menacing. She is a “wannabe” Super and a mega-fan of Elastigirl. Her superpower is the ability to divert and manipulate objects around her by creating voids that allow the objects to appear and disappear. Super cool! And here is who I think is most likely gonna be the main villain of The Incredibles 2. As her character description reads, she is a huge fan of Elastigirl and a wannabe super. Does that remind you of a certain character who was a mega-fan of Mr. Incredible? I think Voyd may be a reflection of Syndrome in a way. Given that this movie takes place right after the original, Voyd was likely a child when she became a fan of Elastigirl the way Buddy/Syndrome did when he was a child. She, like Buddy, is a wannabe super, but like Syndrome, she may also have gotten angry with Elastigirl for something she did, and either from the beginning or the middle of the movie, she becomes devoted to wiping out the supers. And what would make her a villain that fans of The Incredibles would LOVE is if she was the SISTER of Syndrome. Not sure how plausible this could be, but hey—it could happen.